The final teeth to erupt are your Wisdom teeth or third molars.They are most likely to come in during your late teens or early twenties. Wisdom teeth can disrupt the bite during development. Often the jaw is not large enough to allow them to come in properly. Dr. Brightleaf is skilled in neuromuscular dentistry, which means she understands the complex relationship between the teeth, jaw and facial muscles. She may need to refer you to a specialist to remove wisdom teeth that threaten to destabilize your bite. Dr. Brightleaf may suggest wisdom teeth removal if they have the potential to harm other teeth around them. Teeth Shifting: Impacted wisdom teeth may shift surrounding teeth, causing bite irregularities and pain. 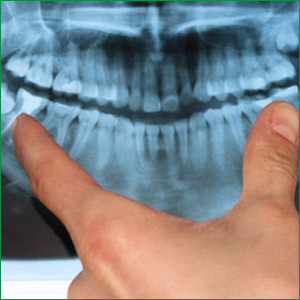 Bone Loss and Jaw Expansion: Impacted wisdom teeth may play a role in bone loss and expansion of the jaw. Congestion: Wisdom teeth may contribute to sinus congestion and headaches. Cysts and Tumors: Impacted wisdom teeth may be a factor in the development of bone destroying tumors or cysts, including cyst formation in the surrounding gum tissue. Gum Tissue Irritation: Gum tissue surrounding impacted wisdom teeth tends to be more susceptible to gum irritation. If wisdom teeth do not fully erupt and become crooked, it may become difficult to adequately clean the gums. Periodontal Pockets, Cavities and Bone Loss: Difficulty cleaning gums makes it easy for debris to be lodged, creating the perfect setting for bacteria. The resulting bacteria may produce periodontal pockets, create cavities and lead to bone loss. Changes in Orthodontia and Dentures: For children, wisdom teeth may adversely affect the results of orthodontia. For the elderly, wisdom teeth may undermine the functionality of dentures.